Listen up, beginners: Pumping out as many as you can isn't actually the best move for you. 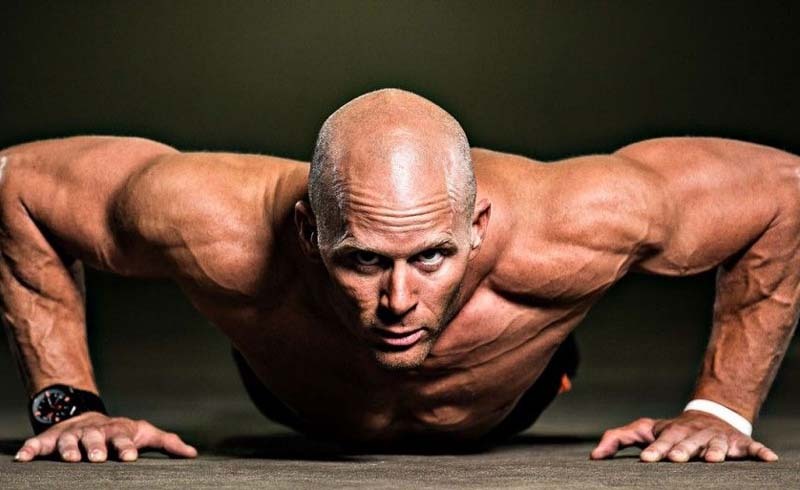 Push-ups are arguably the most classic move in fitness—and for good reason. For one thing, a no-equipment exercise means you can break into a workout no matter where you are. And if you’re going to do just one move, push-ups are a solid choice. Not only do they work your arms, but they also target your chest, shoulders, and abs. Not bad for such a simple move! A proper push-up requires you to keep your back straight like a plank, maintaining that form while you lower yourself to the floor. If you’ve been pumping out 20 push-ups at a time but your back is arched and shoulders hunched, you’re just working against yourself—and you won’t get the results you’re looking for. Bad form puts you at risk for injury, and you aren’t getting the most out of your workout, says Singer. As an easy rule of thumb, aim for ten push-ups, suggests Singer—but what those ten look like depend on the person. Beginners should aim for ten incline push-ups; intermediate exercisers can try ten regular push-ups; and those who are more advanced can make the move harder by doing ten slowed-down push-ups, pausing at the bottom between reps. Most beginners like to practice with knee push-ups, but Singer warns against starting there. “It completely changes the mechanics, and most people do it wrong,” he says. Knee push-ups don’t work your core like regular push-ups do, and bad form can hurt your shoulders and back. For your next workout, increase to six reps. Once you’ve mastered three sets of ten, move to a lower incline, like a step platform. Again, aim for three sets of ten before moving on to your final goal: a standard floor push-up. Even if you can only do five, you’ll be noticeably stronger than when you started out. “When you get into full push-ups, you should see your arms getting more firm,” says Singer. One last caveat: Push-ups improve your strength, but one move alone won’t reshape your whole body if you’re carrying excess body weight. “If your goal is to look better and tone up, then nutrition is the most important piece,” says Singer. Shed some pounds through healthy eating while you add in physical activity, and you’ll be impressed by what you see in the mirror.